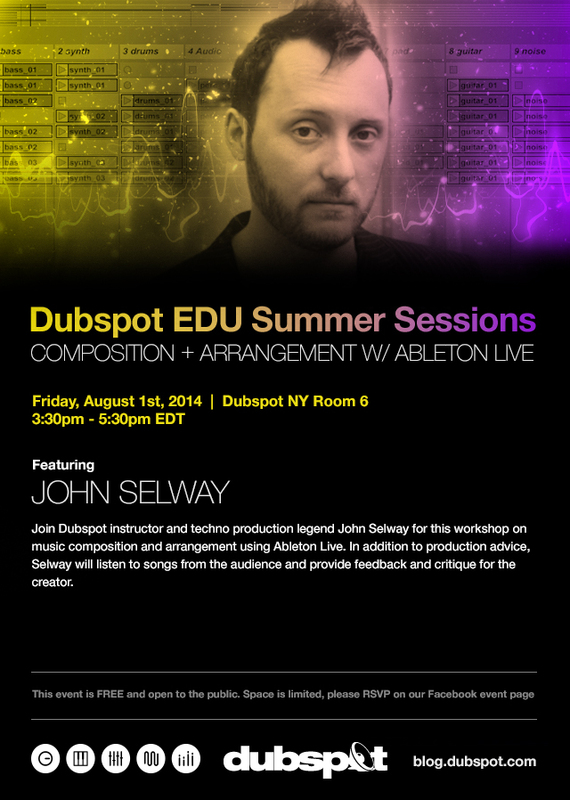 On Friday August 1st, our Dubspot FREE EDU Summer Sessions continue with a special Ableton Live workshop featuring techno DJ and producer, John Selway. Interested in taking Music Production w/ Ableton Live classes Dubspot? We have classes starting on 8/4 in NYC and 9/22 in LA. This course is also available online. Register today! Join Dubspot instructor and techno production legend John Selway for this workshop on music composition and arrangement using Ableton Live. In addition to production advice, Selway will listen to songs from the audience and provide feedback and critique for the creator. Check out the first in John Selway’s Techno Fundamentals series above. Read more about his techniques and check out parts two and three of this series in our Techno Fundamentals Roundup. John Selway is a DJ, producer, and music educator based in New York City. He’s released acclaimed and successful singles and remixes, both on his own and as a collaborator in with various artists including his frequent partner-in-crime Christian Smith. Most recently, two of Selway’s tracks were included in the OFF Sonar Compilation. More info at selwaymusic.net.